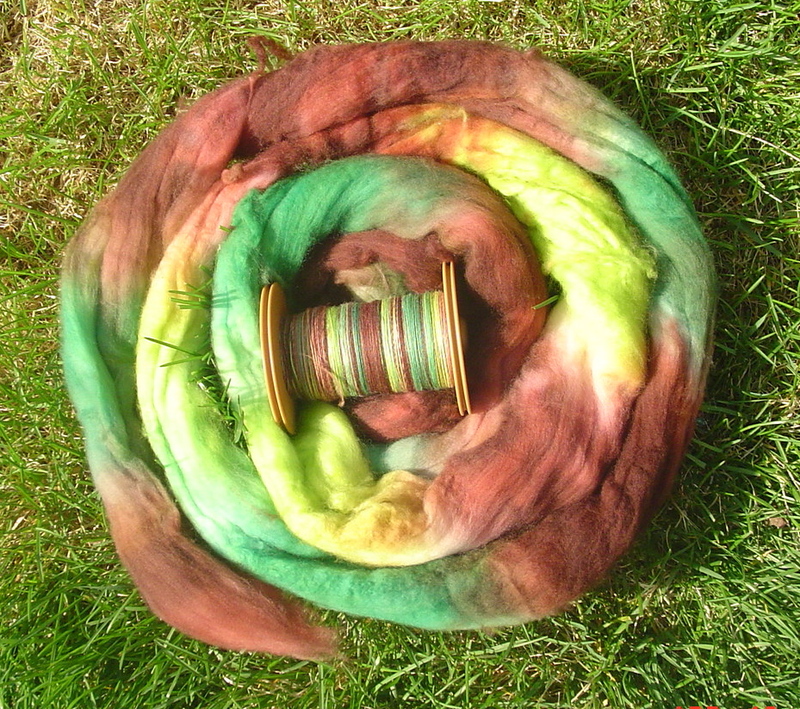 A long time ago, when I first started spinning, I spun some really fluffy yarn. It was some of the squishiest and softest stuff ever, and I really liked the gentle carmel tones to it. In the past couple of years I’ve hoped to knit it into something. 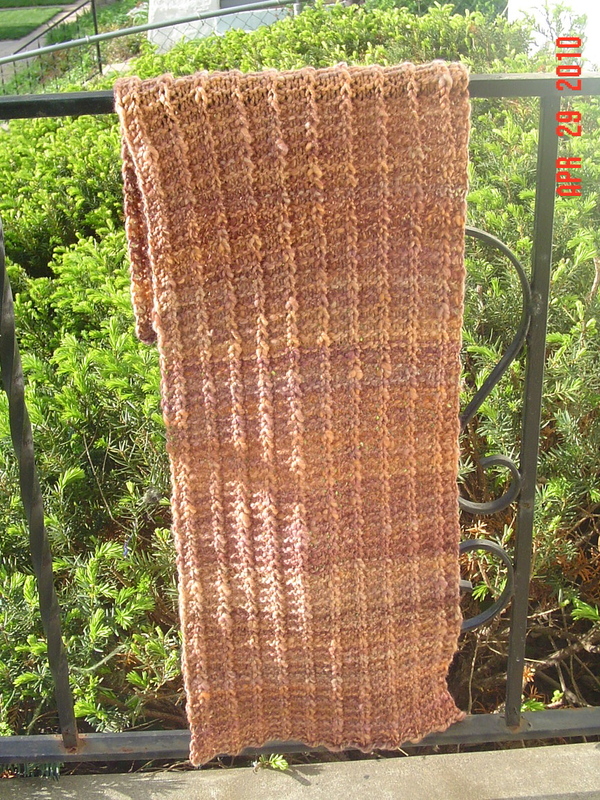 When I saw the one row scarf, I figured this would be the perfect pattern to showcase its softness and color. So I balled it up, knowing what pattern I’d use. And then from that point on every time I cleaned or reorganized I’d move that ball of yarn and think “Boy, I really should knit that scarf.” It just didn’t happen. Until this past weekend. Unfortunately, I really didn’t have a lot of yarn, so it is more of a neckwarmer to be worn with a pin, but it is still lovely and soft and I think I can get some use out of it. Even better? I’ll never have to move that ball of yarn again! I’ve finished my pyroclastic socks in March Hare. The unusual foot makes for a lovely fit in the shoe. 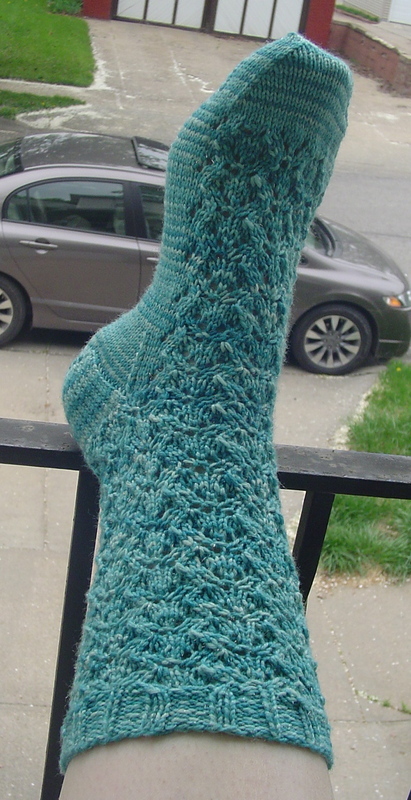 The yarn itself is very thin and will make for a great summer work sock. These were an easy and addicting lace pattern, I’d consider doing them again. I am working on catching up on the “Round the Twist” Glynis KAL. I’ve been quite behind, but I did manage to finish the first sock finally. I’ll work on the other this weekend. The yarn is tempted glam grrl, so it has just a bit of silver sparkle. I love the color, but I realize it is basically the same color which I am using for the pyroclastic socks. In other knitting news, I seem to be nigh on incapable of knitting anything but socks. I started a pullover yesterday and let me tell you…..it did not go well. I really need to get my garment mojo back! But I finished my latest pair of easy on the go socks. 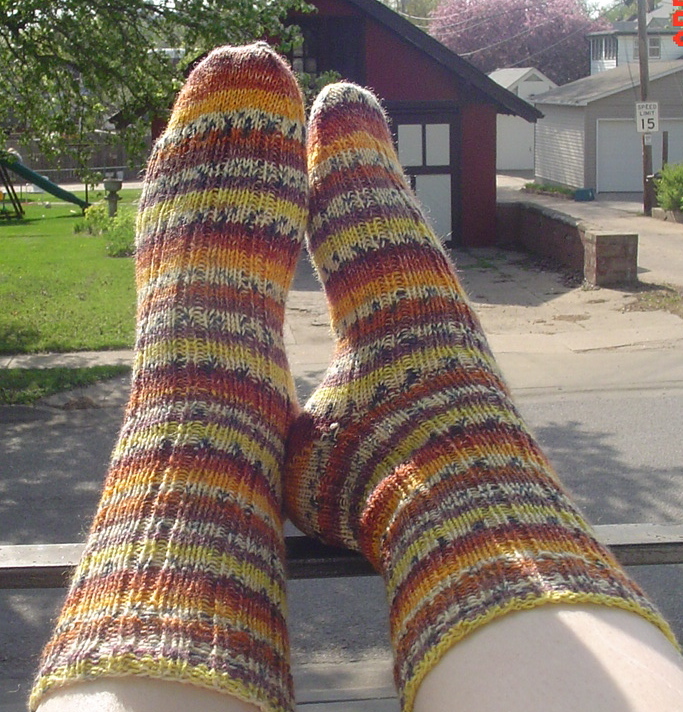 If you remember, I finished the first sock during the month o’socks, but did not work on the pair again until recently. After another full day conference and some knitting on the sly, I got them done. 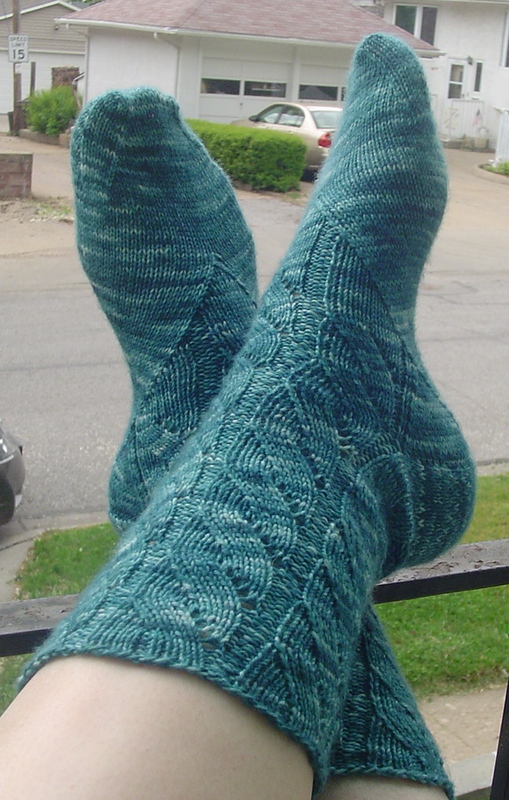 These are loosely based on the oak rib pattern from Vintage Socks, but they have a short row heel. The yarn is Opal. I really prefer that short row heel with self striping yarns since you then do not get the strange thin bands of color over the gusset area. My next pair of easy on the go socks are already on the needles. I’ve been working on 8 oz. of merino from BMFA sheep to shoe kit, I am 1/3 done with the spinning portion of this and I figured it was high time to get a photograph. The colorway is “froggin” and I love the rich brown color in it. This will be a 3 ply when I am done with it, but it will be quite awhile, I always forget just how long it takes to spin 8 oz. so thin! 5 skeins of noro silk garden, in an entrelac pattern. 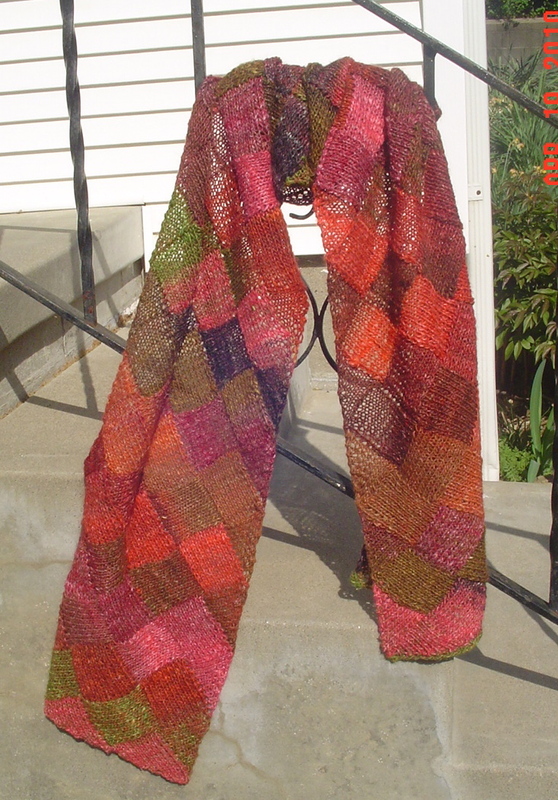 Makes for one pretty scarf EVERT time! 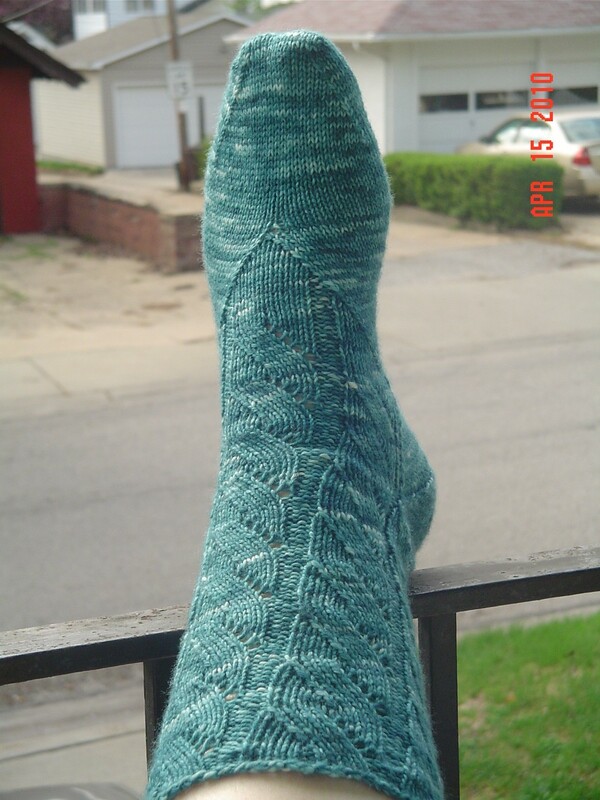 I started the pyroclastic pattern on April 1, as my April sock knitters annonymous entry. This is done from March Hare merino, and I think the subtle color variations are just lovely! The sock has an interesting toe, akin to the francies I love so much, so it provides such a nice fit around the ball of the foot!